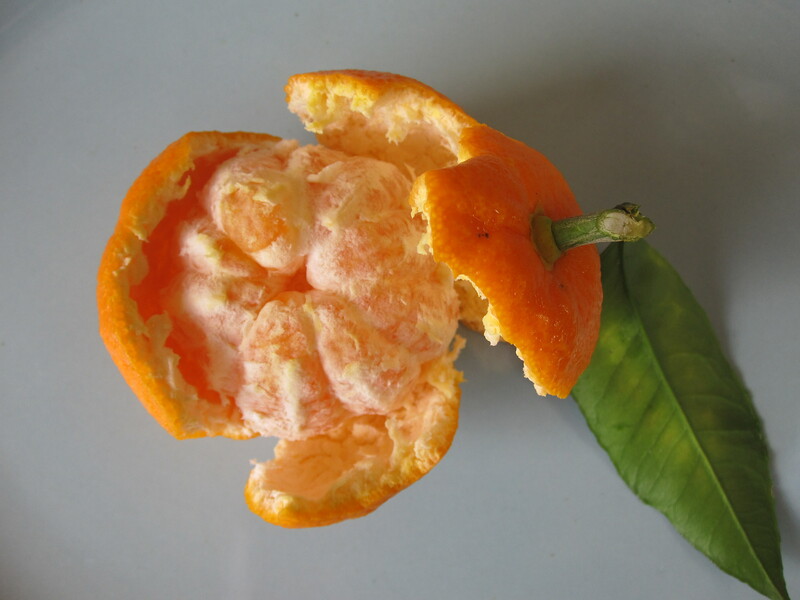 Remove the peel from 4 satsumas. You want only the zest and as little pith as possible. A vegetable peeler works well. 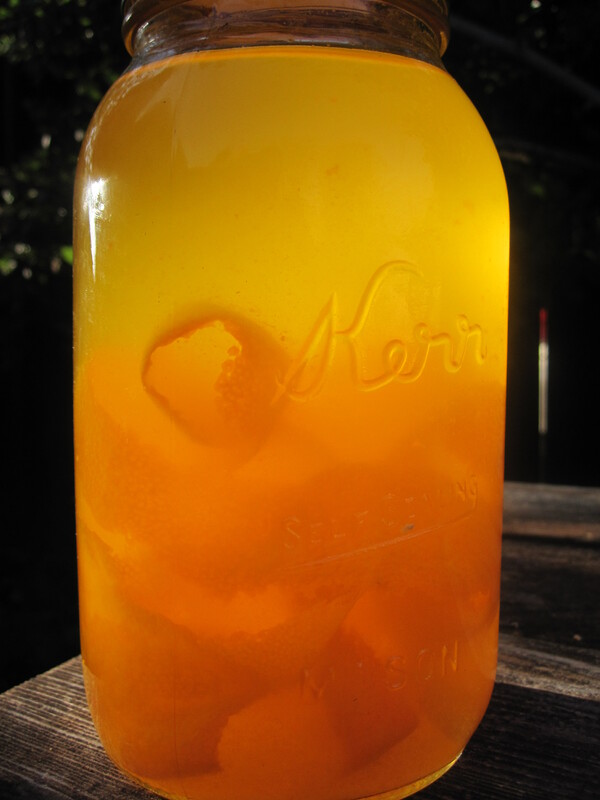 Drop the peel into a sterile one quart jar. Heat the sugar and water in a small pot over medium heat until the sugar melts. Add the satsuma juice and whisk to combine. Bring the mixture to a simmer and let cook gently for 5 minutes. Remove from heat and let cool completely. 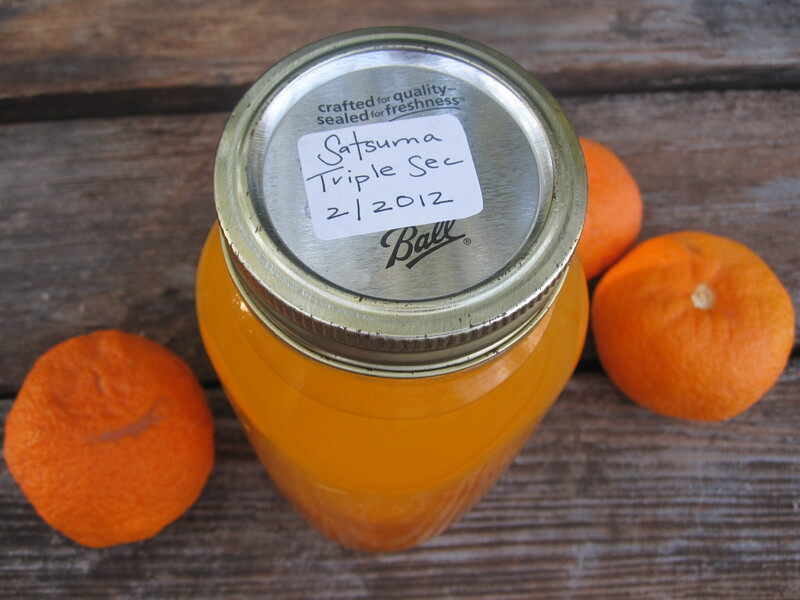 Measure 2 cups of the satsuma sugar syrup and add it to the jar with the peel. Add the vodka to the jar. Cover and let sit in a cool dark place for one month. Strain through cheesecloth and bottle in a sterile jar. Add to margaritas in place of simple syrup. Muddle a sprig of mint, douse it with sparkling water, a shot of triple sec and top with a hardy splash of whisky. We have a sad story. Our little satsuma tree (teeny) was visited by a mouse who neatly ate our fruit. We only managed to enjoy three of them. The tree was covered by a tarp, so the little rascal got away with the haul. Oh Mom, I wish I had known. Next year you will be on our list for sure! You have a summer of marvelous cocktails ahead of you (but don’t wait that long…)! Your triple sec is gorgeous – I love infusing. Ah, don’t you worry about me! My new favorite cocktail is hard to resist. *Sigh* Yet another reason to move to your part of the world! You tempt me, Karen. It’s beautiful triple sec. You should try infusing berries this summer…raspberry vodka is SO easy. You guys get good raspberries, don’t you? Raspberry vodka sounds fantastic! I just pruned our vines back and am hoping for a heavy crop this year. Yum. Buying a bottle of vodka in duty free on my way home tomorrow and making this with the last of the blood oranges of the season. Can’t wait to try it, patience is a virtue right? Patience may be a virtue, but truth be told, this triple sec tastes great from day one. Enjoy!